Ratchets don't find their way onto my test benchvery often. 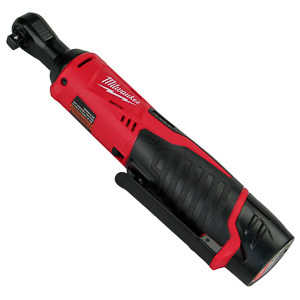 This makes this week's test of the Milwaukee 2457cordless ratchet a special occasion. I was so excited I removed andreinstalled every bolt I could find in my workshop with thisratchet. Let's take a look at what the 2457 can do, and how itstacks up against air powered ratchets. Impcat wrenches excel at driving large bolts and nuts under demanding load conditions. They must be used with impact-rated sockets. Impact wrenches use almost exclusively the square drive coupler. Depedning on the torque produced by the tool the size of the driver varies between 1/2" to 1". The most important consideration when purchasing an impact wrench is the maximum torque produced by the tool. Match the torque number to your intended usage scenario. High torque impact wrenches are large and heavy tools. If you plan on using your impact wnrech only for light to medium duty, purchasing a smaller model is the better choice. A heavy tool is usually far less productive than a properly sized model. Cordless impact wrenches are less powerful than their air powered brothers. Air impact wrenches last much longer than electrical models. They are the superior option, if air is available in your location. "The king of torque. Can replace air wrenches in all but the roughest tasks. Large battery. Turns slower than air, but has no cord. Great for auto nuts." "A capable, sturdy, and well-engineered ratchet. Great if your bolts stay below 35 ft-lbs of torque. Lacks speed and power for large projects."